Chris Forrester scores the winning goal for Posh at Northampton last season. Tickets for the early-season League One derby between Northampton Town and Peterborough United at Sixfields on August 26 go on sale from next Monday (August 7). 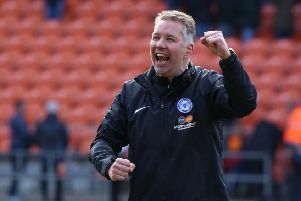 Posh have approximately 1,400 tickets to sell for the all-ticket fixture and for the first time the club will be using their Priority Points System to allocate the tickets. Michael Smith congratulates Chris Forrester after his winning goal for Posh at Sixfields. The system was formulated in the close season to ensure a fair way of selling tickets for games that have a restricted ticket allocation. Tickets will be on sale at the ABAX Stadium Box Office, via the Ticketmaster hotline 0844 847 1934 and online at www.theposhtickets.com.